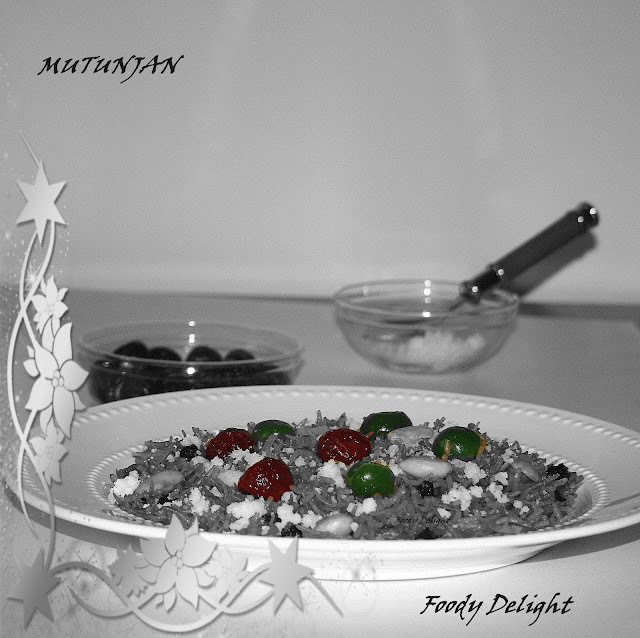 Mutanjan is the sweet rice dish more commonly prepared in Pakistan. It is said that mutanjan is version of zarda with few slight variation. Zarda is basically traditional south asian sweet rice dish made with rice, saffron and sugar along with variety of nuts. Whereas mutunjan has multi coloured rice and in additional candied fruits and peels are used which is the very essential part of mutanjan. This is perfect rice based dessert to your any occasion. I prepared this dish during my new year party and believe me this dish was the best fit to whole dinner party combo. Soak the almonds overnight.Next morning peel and keep them aside. Wash and soak the basmati rice for atleast 30 minutes. Then placed the pot filled with water. When water starts to boil, add in the soaked rice and cook until the rice is 80% done. Once rice is done, strain them and place them on plate. Then place another pan on medium flame and add butter into it. When butter melts, add crushed cardamom pods. Fry for 1 minute. Then add brown sugar and ½ cup of water. Mix well and cook till you see the bubbles in the syrup. Now lower the flame and add dry coconut, almonds and raisins.Allow the syrup to boil for some more time. Then add cooked rice.Mix everything well. Cover the pot with the lid and let the rice cook on low flame until done. In middle time, just give a stir and add glazed cherries and few colour drops on the top. Do not mix it now. You can mix it later. Otherwise all the colours gets mixed up.When the mutanjan rice is ready to serve. Serve it with mawa at top. very yummy dish. Mouthwatering. First time here. You have a nice space. Very happy to follow you. Do visit mine if you find time.